One Big Buttery Place | For the love of butter! For the love of butter! Mix the sugar and syrup together into a paste and place on a medium heat. Bring the syrup to the boil and give it a good swirl every now and then. When the syrup starts to bubble, start making the meringue by whipping up the egg whites and cream of tartar in a clean, dry bowl. I use a KitchenAid for all my baking, but it’s particularly important for this type of buttercream as there is a lot of whisking involved. Stop whisking once the egg whites form stiff peaks. Bring the syrup up to a consistent boil, the temperature should reach 115°C before taking off the heat. Start whisking the meringue and slowly pour the syrup in. Keep mixing until all the syrup is incorporated, and then blast it on a fast whisk for 10 minutes or until the mixture is cool. Chop up the butter and add it ALL slowly, bit by bit. After lots of mixing, a beautiful Italian meringue buttercream is born. Add flavour and mix, è finito. Not so tricky after all, I do recommend a sugar thermometer. The wedding cake flavours were lemon, carrot and vanilla (working top to bottom). I have to say the carrot cake recipe has also stolen my heart. I’m having a very good week for being wooed by food. The recipe is on the BBC Good Food website, please see link below. The cakes were baked, cooled, carved and buttercreamed. The bottom and middle layers were dowelled to death, there was probably more wood in there than cake! Can’t afford tier slippage at a wedding….. heaven forbid. A good buttercream crumb coat is necessary before adding the final layer of buttercream. Refrigeration is important to let those layers get hard for extra buttering. Neat, smooth lines are very desirable. The theme of the cake was Lego to honour the groom’s Danish heritage. I bought a silicone Lego mould to make individual fondant pieces to build the cake board. The side of the cake was simply built with rectangles of coloured fondant icing. I got very sticky whilst putting this together and I flicked buttercream everywhere. I can’t take credit for the cake topper, the Lego people are the real deal. A massive congratulations to the bride and groom. Wishing you both a very happy and buttery future together! It’s taken me a week to get over this caketastrophe. My sister had a welly wanging party for her birthday so I thought it would be nice to bake her a simple Wellington boot cake. How very wrong I was. Sometimes, things just don’t work out and when you bake as much I do, it only makes sense that the disaster would occur on the same day as trying to impress extended family. It started off well, the elderflower and lemon cake tasted zesty and shaped up okay. The problem I didn’t foresee is that the buttercream would separate as it contained cream and elderflower cordial. Hmmmm. The next error I made was not thinking ahead and that the buttercream would need refrigerating because of the cream. So I iced it ahead of time so that I could go to work. No no. Never put fondant icing in the fridge. I did know this but thought that physics wouldn’t affect me on the one day I needed it not to. As the shaft of the welly made its way to the table, I decided to take it down for its own good. It was Bake Off worthy for about 1 minute. In the end, the welly was well and truly wanged. I challenged myself to making a mirror glaze cake this weekend. After a lot of research and reading, I still managed to fluff it up. A word of caution to anyone who wants to make a mirror glaze, it is a sticky, convoluted and expensive cake if you keep making mistakes…. I made a light vanilla sponge with a thin layer of vanilla buttercream and raspberry jam inside. I coated the cake in buttercream and smoothed out the sides and top. This is really important, you need a really smooth surface for the glaze to stick to and dribble across. In retrospect, I needed to smooth mine a little bit longer as even the SLIGHTEST bump or crumb is exaggerated once the glaze is on top of it. The crumb-coated cake needs to be refrigerated for about half an hour before glazing. Another layer of buttercream is a good idea and then just keep smoothing until you can’t stand to smooth anymore. I hadn’t cling filmed my tray and all the colours had melted into one big mess. I had to go back to Sainsburys and buy more white chocolate and start again, pfffft. By this point, I had splodged blue glaze all over the kitchen floor, everything was sticky and I was pretty grumpy. After much mopping, I calmed myself down and went back to the shops to discover I had bought 300g of dark chocolate. I recommend you do not do this, clearly I was not with it by this point and got very annoyed upon discovering this. Round 2 of making mirror glaze was again unsuccessful. I tried to use lighter colours but it all melted together to make a Halloween-like mess (there was orange, purple and green present). It looked gross when I poured it over a partially glazed cake of various dark shades of blue and green. Finally, I commenced Round 3 by colouring over it again to just make purple and turquoise. I slopped it on the cake (all patience had evaporated by this point) and it finally looked worthy of eating. The glaze itself takes a matter of minutes to make but the cooling part takes longer (30-50 minutes). If you pour glittery glaze on first and dribble non-glitter glaze over the top you can achieve a rather nice look. I wish anyone who wants to make a glaze the best of luck. You know why. I’ve made chocolate ganache for years and this morning it was a total flop. I heated my double cream slowly and took it off the heat before the boil. I threw in the chopped up chocolate and stirred it. I looked away, looked back, and it was a bloody mess! All grainy and split or ‘seized’ as the chocolatiers call it. I was very upset as I had a deadline and no time to start phaffing about buying new ingredients. Then I learnt, you can save it !!! The reason it’s split is because the fat content is too high. I used a baking chocolate which I don’t usually use because it was on offer. This is where I went wrong, always opt for non-baking chocolate. Anyway, I warmed a little milk and whisked it in quickly. Only a tad each time, I just stopped when it looked shiny and smooth. So there you have it, no need to panic, as Bridget Jones’ mother would say ‘just stir it Una’. Oh my goodness, this recipe has changed everything. Best cake I’ve ever made, hands down. I’ve avoided making salted caramel for a while for fear of burning it. How wrong I was. Don’t rush melting the sugar and do not deviate from the recipe! The tricky bit is at the end when you need to mix the caramel with the cheese frosting without melting it. Also, if you wait too long to drizzle the caramel on the cake at the end, the caramel can solidify and become tricky to work with. This cake didn’t last one hour! My nana turned a whopping 90 today. I made a chocolate brownie cake and covered it in dark chocolate ganache and edible glitter. It went down very well considering she kept forgetting she was 90! I really enjoyed making this cake, I’ve neglected my baking recently for all sorts of kitchen/boiler related reasons. Regardless of the situation, I have decided to bake on! That is what Mary would do, and don’t we all want to do as Mary does? I digress. I whipped up a vanilla sponge with a classic 8,8,8 oz (sugar, self raising flour, butter) to 4 egg ratio and bunged it in the oven at 180C until risen, golden and cooked in the middle. I mixed up enough buttercream to sink a kayak, divided it up and coloured it in varying shades of blue. If you whip your buttercream lots and lots until it goes pale (before colouring it), you will achieve a smoother, paler buttercream. The key to any good decoration is a cool cake. Once cooled, I cut it in half and layered lots of raspberry jam on one half of the cake and blackcurrant jam on the other (it’s good to mix things up every once in a while). I spread buttercream thinly on top of the jam and sandwiched the cakes together. The coloured buttercream was carefully spooned into three piping bags. I like to put the piping bag in a mug and then fill it up- stops the bag falling all over the place. It is best to avoid buttercream splodges around the top of the bag as it will go all over your hands very quickly once you start squeezing ! To make a neat pattern I piped sausages of colour around the edges of the cake, alternating when it felt right to do so. The tricky bit is to use a spreader and blend it together to get very straight, smooth sides. I can always feel my heart beating LOUDLY when I approach any cake with a spreader (it’s very distracting). The remaining buttercream is used to make a swirly pattern on top to finish. I spent an awful lot of time touching it up, it’s hard to say when to stop phaffing. After all that, best not to keep it near a radiator as it will make you cry when all that smoothing and swirling melts everywhere. Well, I had an interesting time making this cake. The first prosecco based recipe I tried was a total, utter flop. I made two fizzy, oily pancakes which dripped all over my oven. Thanks recipe. The cakes went in the bin, GBBO style. No fuss, mix that lot together and dollop into an 8 inch cake tin and bake at 180C. The mascarpone cheese filling is very much down to personal taste, I don’t like it too sweet. You have to be careful with the prosecco or it will be too sloppy, so just be slow with the additions. Assemble with a creamy layer in the middle and some on top. Dash with pistachio nuts and lemon zest and voila! 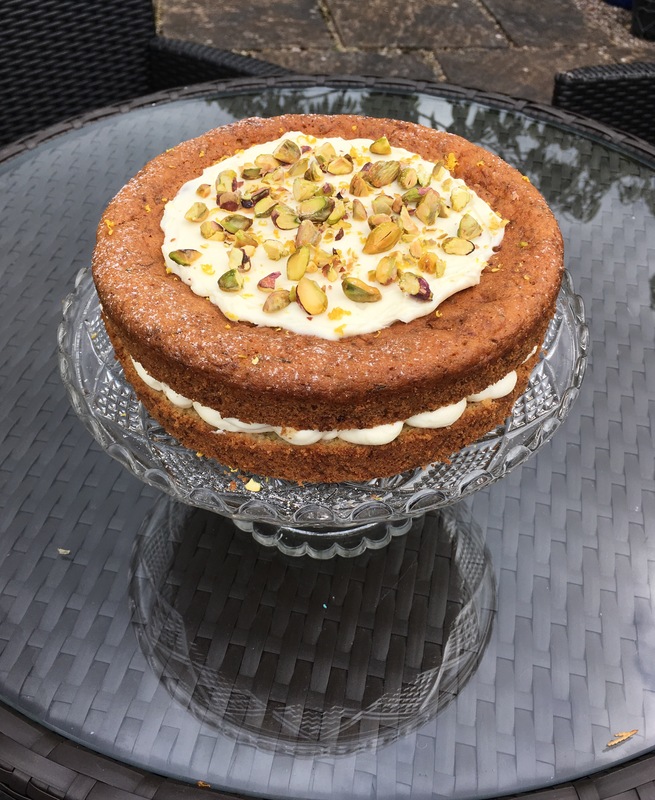 A light and tasty cake with a hint of prosecco and seasonal vegetation.